In the Spring 2017 semester, Dr. Brian A. Hoey (Anthropology) together with students in his course “Culture and Environment” (ANT & SOC 466 and 566) planned and conducted a community event to demonstrate how cultural ecology can provide all of us with a holistic vision of varied relationships over time and space that human populations have had with their environments. The course itself is designed to examine symbolic and structural dimensions of struggles over defining, organizing, and controlling the natural environment from a biocultural perspective. The event, titled “You Are What You Eat,” was intended to provide literal food for thought. In a nutshell, if you will, we took an anthropological approach, specifically that of cultural ecology, to examine human subsistence strategies. That is to say, adaptations that are represented in subsistence practices of hunting and gathering, horticulture, pastoralism, and agriculture so as to better understand the relationship between culture and environment. When you get down to it, much of this relationship is forged out of particular traditions for procuring the food that sustains us. At this lunchtime event, we presented information that helped people appreciate the varied dimensions and impacts of these different subsistence strategies. This included tasty samples of food that represent these practices. 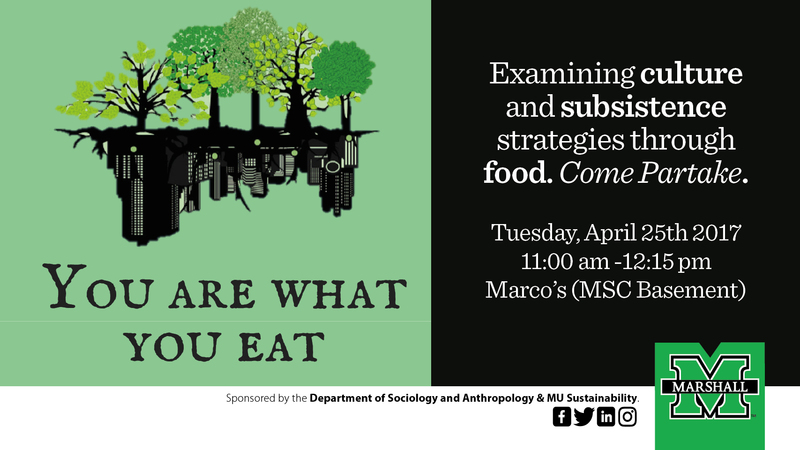 We partnered with MU Sustainability to bring additional information and useful resources for attendees on ways that they can put to good use what they’ve learned. All plates, cups, and cutlery used at the event were composted.